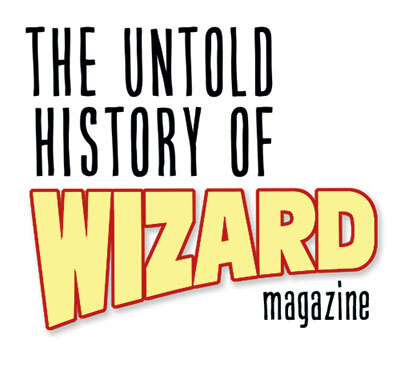 For an industry obsessed with history, we haven’t done a very good job of documenting the history of the rise and fall of Wizard Magazine. I’m re-reading sections of Sean Howe’s fascinating history book Marvel Comics: The Untold Story and I’m impressed with his detailed history of Marvel Comics. I’m told by industry insiders that Howe did a pretty good job collecting facts and opinions, and for a historical record, the book is fairly credible. There was a big, obvious reason to tell the story of Marvel Comics. We are, as an industry of fans, fascinated with the history of the comics, the characters, and the creators. Over the years, we’ve seen some excellent books that document the early days of important characters from Marvel and DC, including the intriguing history of key creators. There are some inspiring and depressing stories and anecdotes that swirl around this ever-changing art form. These stories are usually about the mainstream characters and creators, but Wizard was something different. For the most part, Wizard played a unique role in the middle, neither creating characters nor publishing the stories. Then again, Wizard was not a mere passive, journalistic observer. Wizard Magazine is a story of disruption. It’s the story of how luck, talent, and timing aligned to change comic books. As a journalist and fan, I remember the industry pre-Wizard, which looked, felt, smelled, and tasted…different. From the movies to the media to the mega-conventions, things were already changing when Wizard arrived. That’s not to say that Wizard was the exclusive agent of change, but it was certainly a potent catalyst that stirred things up. A lot. Prior to Wizard, there were comic book conventions, but they weren’t the organized glam affairs we enjoy and/or tolerate today. Often these were seedy, but friendly, events that were often held at some Ramada Inn close to a highway off ramp. Collectors, readers, and dealers would converge for regional sales and geekery events. Sure, there were large national events like San Diego Comicon, but it was still in a relative infancy compared to today. It was not yet the Hollywood-fueled mass media juggernaut it is now, and part of that is related to the unexpected and unprecedented rise of Wizard Magazine. As a reader, Wizard appeared to be a cool club for young, goofy, outcasts who just happened to be united by superheroes. It appeared that Gareb Shamus was perhaps the funniest, smartest, luckiest fanboy to ever walk into a comic shop. In some ways, maybe he was. Howe’s history of Marvel Comics addressed what appeared to be true and what is historically accurate. Like the Marvel story, there’s more to the Wizard story than most people realize. The rise and fall of Wizard is a story worth researching and reporting for similar historical reasons. I certainly don’t know the whole story. I wrote freelance for Wizard, I worked there, and then freelanced again after I left. I remain friends with many people who worked at Wizard, so I know bits and pieces of the complete story. There are many reasons to document the untold story of Wizard, including the fact that we have already seen two significant personalities pass away last year. What makes this interesting is that Wizard’s impact was not limited to the monthly magazines, the conventions, or even the online sites. Wizard exploded and the blast radius shook every corner of the comic book industry. Wizard was a major disruption for an industry that probably didn’t want to be disrupted…but perhaps needed it. Was Wizard a chronicler of events or did Wizard precipitate change? Would publishers like Image and Valiant and Chaos have exploded if Wizard wasn’t there? How much did Wizard contribute to the meteoric rise of certain creators? How much did Wizard contribute to the speculator boom and bust? Let’s discuss it. Many of you have good feelings about Wizard. Fond, nostalgic memories that came every month polybagged with trading cards and offers for #1/2 issues. Those memories are based on the output of a few immensely talented individuals and a rotating staff of equally talented writers and designers. But Wizard had an ongoing love/hate relationship with many different creators and publishers. Any industry-changing disruption will be met by those who don’t want things to change. The truth is, not everything that changed was good. Wizard is often blamed for fueling the speculator boom that damn near killed the goose, the golden egg, and all the sparkly hatchlings. Wizard was blamed for building up a cult of personality around certain marginal creators. Was Wizard solely responsible for mediocre talent that barfed out crappy comics? Not exclusively, no, but the magazine certainly nurtured certain artists and writers, even if their artistic “talents” were largely questionable. It’s amazing what money can buy. There were professionals like Frank Miller, who spoke out publicly against Wizard. Others simply saw Wizard as a necessary evil. In the 1990s, lots of people made lots of money from comics. Publishers, creators, dealers, and speculators were making money, often based on the recommendations printed in Wizard magazine. The people not making big money were the hard-working writers, editors, and designers who actually made the publications. Wizard’s impact runs far beyond the paper boundaries of the magazine and price guide. Wizard Entertainment was everywhere: comics, conventions, books, videos, anime, toys, collectible card games, television, animation, credit cards, a dot.com venture, even a military magazine. It’s interesting and perhaps ironic to note that the only thing that remains of Wizard is the name “Wizard World.” But there was a dizzying time in Wizard’s history where a bunch of writers, editors, and designers hopped on a plane to Rosemont, IL to run a comic book convention that the company had purchased (or acquired or partnered with, I’m not sure). Wizard also had an early, but significant impact in the digital space as well. I was there in the early days of the Internet as we launched an early version of Wizard World on America Online. Wizard World Online was a forward-thinking effort that was profitable for Wizard and significant for the industry. We helped many pros and publishers get started online, but later Wizard was accused of failing to make the transition to digital publishing. Online, we experimented with user-generated content, chat rooms, multimedia, fan communities, and fan art. At a convention in Chicago, I met a married couple who met online in our chat rooms. Ironically enough, almost all of that content from Wizard World Online is now gone. Nobody had the foresight to save the massive amounts of creative content that Rus Wooton and I published online. These days, everything that’s published online is documented and archived somewhere, but at that time, we didn’t save the daily content that we generated. News, features, interviews…all gone. Wizard’s impact was online, at comic book conventions, and even on the TV screen. This is a true-life drama drenched in money, ambition, betrayal, and creativity. As a reader, I believed that Stan Lee wrote all the comics and that a staff of talented artists worked tirelessly together in the Marvel Bullpen. Howe’s book uncovered the truth and the fiction to the things that were happening at the time. The same should be done with Wizard. To the casual reader (and to many working pros), the magazine was shaped every month by Gareb Shamus and that the office was non-stop hysterical hijinks and pranks. To be certain, Wizard was often quite fun and there were pranks, but there was plenty of serious work to be done. The truth is that there were many, many talented people working on the magazine. You’d barely know it from the outside, but the true influencers were not the names that you’d recognize. The masthead in the magazine only told a fraction of the real story. Wizard wasn’t just disruptive to the business comics. It was a turbulent and disruptive force for many of the people who worked there as well. In the end, it all fell apart with accusations and lawsuits. Culturally, we are interested in disruptive forces. We are fascinated with the stories of disruptive companies like Apple, Ford, Toyota, Facebook, Disney, Pixar, Google, Microsoft, Zappos, Amazon, Netflix, eBay, and others featured in business magazines every day. We want to learn more about disruptive leaders like Steve Jobs, George Lucas, Elon Musk, Mark Zuckerberg, and other dedicated visionaries. You may wonder why I don’t grab the flag and start writing a book about the history of Wizard. It’s a fair question, but let’s face it, I’m not really a dispassionate observer. I’d never be considered objective. Plus, my view of Wizard was primarily from “upstairs” in the corporate zone, which was separated Church ‘n’ State from the “downstairs” editorial zone. Wizard, like any temporary cultural phenomenon, is layered with truth, lies, and intrigue. There are heroes and villains, as well as plenty of victims. This is a rich, human story that would help to round out the breathless fanboy reporting that passes for journalism. For now, the history of Wizard remains in the memories, hard drives, and filing cabinets of fans and pros. Somewhere there’s trove of fascinating information just waiting to be analyzed and discussed. Let’s hope it doesn’t take 40 years to tell the story. A favorite topic at the bar for some. You buy the beers, Buddy, and I know half a dozen people (at least) that you can interview right now. Though I’m sure you know them too. I agree. I still miss the friends that we lost last year. We’ll never get their version of the history of Wizard. A history of Wizard would probably be whitewashed and sanitized to the point where it would only be valuable to the people it championed. To tell the real story of Wizard would be a supreme challenge for a skilled and thoughtful journalist. Yes, agreed. A good, unbiased journalist would be able to write a truthful, interesting story of Wizard. And I bet a lot of people would be interested in reading it, but only if it was written honestly by a third-party journalist. Oh we’ve got stories alright. Wonderful stories. Lots of my best friends are people I met at Wizard. As a Constant Reader of Wizard back in the day, part of me wants to know the full story. I discovered Wizard with issue #13 and fell off the readership list somewhere in #100something, a time when real, substantial content started taking a backseat to silly filler, I feel. I had some art published with a couple different contests and Envelope Art within those issues, which was very cool and remains near and dear. To know Wizard’s full story, warts and all, would satisfy some curiosities in a historical/documentary fashion. However, it would also serve the tabloid/TMZ kind of curiosities. For that part, I’d rather leave things unsaid and unknown. Being a growing, aspiring artist back then, Wizard Magazine served as one of the very few connections to the industry I wanted to (and still do) be a part of. I could read about Spider-Man, Batman, Wolverine, etc. anywhere. Wizard allowed me to read, for the first time, about the Romitas, Buscema, Kuberts, McFarlane, Perez, Larsen, etc. and ALL of the other real people creating comics. Putting faces with the names I knew from the bylines. I looked forward to each new issue because it brought me closer to the industry with news, info, drawing lessons, and creator bios. I ate it up. So, in that respect, I don’t want to know about whatever dysfunction or mess that happened to it or caused it to fold. Wizard holds good memories and that’s where I think I’d like to leave it. Unless the telling of its history holds some significance to our present, those are skeletons maybe better off left to rest. Mixed emotions — I wanna know, but I don’t wanna know. Nuff said. Some of the stuff behind the scenes is really interesting. Some of it is kind of ugly. All interesting takes. I guess I could compare it to some of the metal mags available in the 80s and early 90s. A bit for the more obsessive fan. While I loved comics mostly for the stories, I was only vaguely informed about creators or how the industry worked. When I bought a Wizard the few times I did, it was more as a casual fan. Maybe that is why, while I liked it I didn’t get every issue. While I knew who was in what band, what label they were on, who they were touring with, what equipment they used ect. I also didn’t have the jack to buy expensive back issues witch may have played into it. There was still a bit of a glass ceiling feeling to the hobby back then. The owner of the LCS would stare disapprovingly while I browsed. If I asked a question he would make me feel like I was stupid for asking while the cool books were all behind a counter. Forget getting much in the way of hot books from him, I think he hoarded them all while putting one up on the wall at max asking price. I had better luck and much more happiness from going to all of the local gas stations, Pharms, and grocery stores and hitting the spinner racks. Obviously the people there new nothing about comics and just filled the racks. But they were happy to let me browse as long as I wanted as long as I paid for a few on my way out. I loved Wizard and was a loyal reader since the beginning when it was still printed in Black & White. I gave it up when it became apparent that it was just an advertising platform for the big guys who had enough money to buy an interview or a product puff piece. Still, it was one of a kind in it’s day and I kinda miss it. In the day, Wizard was a powerful force. The chapter on advertising would probably be a fairly long and revealing chapter. Thanks for the comment. Those were good times. There are stories like this and lots of photos. We need to capture this and share it somehow. Thanks for posting this (belatedly so)! In those same years the Wizard crew was flying down to Rosemont to put on Wizard World, I was a pipsqueak kid in high school, then college, riding the EL up from Chicago to don the orange shirt and give it my all as a volunteer. I started out doing it as a way to get free entry into the convention, but it quickly become more than that. I saw just what it took to put on a show of that size and scope, the insanity of coordinating simultaneous events and wrangling celebrities to be at the right place at the right time. I loved feeling like I was part of something bigger, even as my own contribution as a faceless shirt was very small. And truth be told, I continued volunteering not to add to my comic collection or to meet this artist or that writer. I did it because I liked you guys. Guys like you and Vinny and Darren and Patrick and others. You really did show the volunteers respect, and it made us want to work harder to help you out. All in all, I volunteered seven years until I moved away from Chicago, pulling full-day shifts from before opening to closing every day. And I loved it. You made it interesting. You made it fun. So I’m not sure if you’re still checking this post, but if you are, let me thank you on behalf of all the orange shirts at the Chicago Wizard World convention. Thanks for putting on kickass show after kickass show, year after year. Thanks for letting us be a small part of those times. Wow, thanks for sharing that. We sure did meet a lot of interesting and generous people. You are clearly one of those people. It’s amazing how many lives that Wizard touched. Thanks for sharing your story. I’m sure the other Wizard people will enjoy what you’ve written. I was going to let my subscription lapse in 2010 when they started making every issue “best of” or “top ten” filler content. I saw an ad that said if I renewed my subscription, I could get a free ticket to a Wizard World show. This was the week of the Philly show so I figured why not? I called the # and a guy answers hello without even identifying that it’s Wizard. He proceeds to tell me in the most disinterested way imaginable that it was too late for me to get a free ticket to the Philly show since it was that week. Why? No explanation. I guess I should be grateful, because of him I did not renew my subscription and I did not wind up like who knows how many others who never got refunds when the magazine folded. Darren, seems like you got lucky with that subscription thing. Wizard subscriptions weren’t cheap.